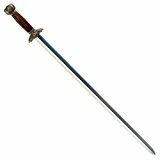 Cold Steel Gim Sword with Hard.. Product weight is 3.5 lbs. Overall Length: 37.25" Blade Length: 30.00" Handle Material: Rosewood Carry System: Wood with Brass Fittings This item is not for sale in some specific zip codes The blade of our Wu Jian is made out of 1055 Carbon steel and measures 30" long by 11/8" wide. For cutting and slashing, both edges are quite sharp and they terminate in a strong, useful point for stabbing. The traditionally styled guard and pommel are cast out of thick sturdy brass and fit snugly on a stout Rosewood handle that is both highly decorative as well as functional.The Gim Sword comes with an excellent wood scabbard with brass throat, chape and sword rings and can be worn suspended from the belt or slung over the shoulder.